For the first time in its 44-year history, the Diocese of Charlotte has 24 men in formation in three seminaries. A contributing factor to the record number of seminarians this year has been the establishment of a minor seminary in Charlotte, St. Joseph’s College Seminary. 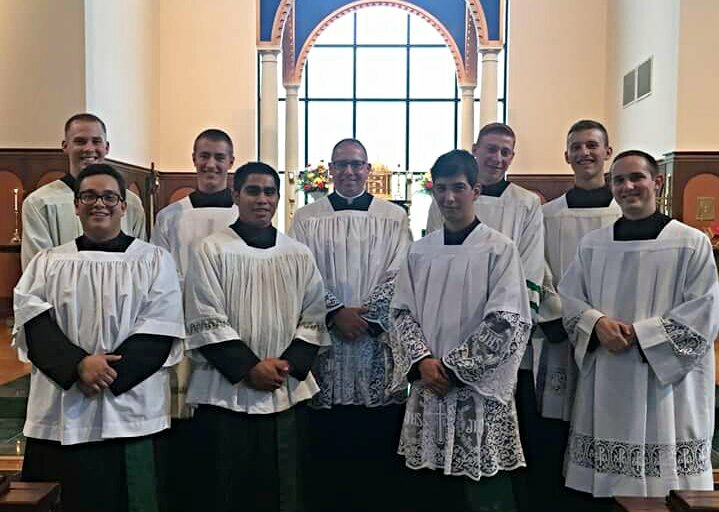 In addition to the eight young men in minor seminary, thirteen men are studying at the Pontifical College Josephinum in Columbus, Ohio and three at the Pontifical North American College in Rome. Of these, five are scheduled to be ordained next June. While every seminarian is an example of a young man’s affirmative response to God’s invitation, this record number of seminarians should also lead us to reflect upon all that the Diocese of Charlotte is doing right. Under the steady and orthodox leadership of Bishop Peter Jugis the diocese has fostered a strong devotion to the Eucharist. Just this past weekend Charlotte hosted its 12th Eucharistic Congress. 15,000 people participated this year, many arriving early Saturday to join in the annual Eucharistic Procession through the streets of downtown Charlotte. Respect for the Eucharist extends to the liturgy as well. An increasing number of parishes in the diocese have returned to the use of the communion paten at Mass, some even the communion rail. This in turn has resulted in a growing number of the faithful rediscovering the traditional practice of receiving Communion on the tongue. Bishop Jugis has also been highly supportive of the Traditional Mass. From weekly Sunday Latin Masses, to First Friday & First Saturday Masses in the Extraordinary Form, the priests of the diocese have been encouraged to meet the spiritual needs of traditional Catholics. In 2016 the diocese offered its first ever Confirmation Mass in the Extraordinary Form. Orchestral masses and sacred music camps are also increasing in frequency. Finally, several higher profile parishes have returned to the traditional practice of only altar boys serving the Mass. This includes the cathedral as well. Three of these parishes presently account for a quarter of Charlotte’s seminarians. The Diocese of Charlotte is vibrant. Dedicated clergy are active in the formation of the next generation. Cassocks, lace, and reverent liturgies are forming the young. It is important to note how this diocesan culture of orthodoxy has carried over into the newly founded minor seminary. Each day begins and ends in great silence. In the morning that silence is only interrupted by Holy Mass. On any given day Mass may be offered in either the Ordinary Form or Extraordinary Form. In full obedience to Pope St. John XXIII’s 1962 Apostolic Constitution Veterum Sapientia, the young men of St. Joseph’s College Seminary are learning Latin. To that end, the seminarians began the year in total immersion, only speaking Latin for the first two weeks of study. Ultimately, at the heart of every vocations success story is prayer. I recently learned an interesting fact about Bishop Jugis. As His Excellency travels throughout the diocese, visiting parish after parish, he often meets young men discerning a call to the priesthood. Each one expressing an interest becomes a personal prayer intention of the bishop’s. He prays for their vocation. Prayer and action. Orthodoxy and tradition. And a love for Our Eucharistic Lord. This is a universal blueprint for fostering discernment and priestly vocations; and not just in Charlotte. Posted on September 16, 2016, in liturgy and tagged bishop peter jugis, diocese of charlotte, seminarians, St. Joseph's College Seminary. Bookmark the permalink. 18 Comments. Can it be any more plain? Traditional Latin Mass = Vocations. Or, wherever the Traditional Latin Mass is, **THERE** is the Church! Are you reading this Bishops?? “BE NOT AFRAID!” Don’t let your declining Baby-Boomer Spirit of Vatican II Priests continue to maintain their blockade on the Restoration of the Faith in Dioceses you are held accountable by God for! Enough with social and environmental justice: Do your jobs and help lead souls away from damnation and toward salvation! Do this by using every possible means to Restore Tradition. Cast your nets into the deep waters the Way the Apostles showed us how to do it. Souls are waiting for you to do this! They hunger and thirst for green pastures and clear water! Stop feeding us garbage! You will be blessed for all of eternity if you do this. Begin by small steps, if bold decisive action is too hard. But whatever you do, rebuild the fences, and dress the vines of your devastated vineyard, and begin **now**. Mary most holy, ora pro nobis ( and great work LG in giving this magnificent news the attention it deserves). I’m happy to see my brother diocese fostering so many new vocations! The diocese of Raleigh has had a great increase in recent years as well. I am thrilled to see the South embracing the Catholic faith more each year. Long before MEF became a norm in our diocese many of these men were already in formation. This boom comes from PRAYER & Eucharistic Adoration (we have many Perpetual Adoration Chapels here now!) — our most wonderful Bishop Jugis had ALL of our parishes praying for vocations at EVERY MASS over 10 years ago! In fact, when His Excellency met my son at age 6 (now 16) he handed him a Rosary(Blessed by St. Pope John Paul II) asking my son to pray the Rosary for his vocation because that’s what he did…. Our Bishop is a GIFT and our Bishop’s example of Christ’s love and mercy is what is drawing young men to discern their call(he turns us all back to Christ!! )… Quo Vadis days have been instrumental… sooo many things are MADE available to the young men AND women of our Diocese — they’re being called to STOP. LOOK UP. BE STILL. LISTEN…. it’s not”just ” MEF that’s fostering vocations…it’s THE WHOLE PACKAGE… ALL OF IT!! Our diocese is striving to meet people where they’re at and making ALL of it available!! Not to mention all of the parishes where now confession LINES, on a weekly and a sometimes daily basis, are more than 3 people long! Our priests are GIFTS from God! We need them… hug your priest…thank him for his vocation and his example… get to know your priests…LOVE THEM — treat them like the treasured family that they are! Please keep praying for our diocese… we will ordain 4 in June… but we will have a gap in 2018. PRAY! I’m from the VaticanII generation.. my faith is strong because of Holy Mother Church’s lovely documents…read in their truth. Be careful when lumping all of us into one basket… many Vatican II people are the families producing the vocations because the Holy Spirit led us to Catholic Homeschooling and other Catholic Apostolates… Please, please, please be charitable…many Priests have not had the luxury of pure formation. (Read George Weigel’s Courage to Be Catholic ) They’re still priests… pray for them! Thanks LG for sharing the news of our diocese…My prayer is that ALL diocese will experience this and with it we will change the face of this country!! St. John Vianney, Pray for Us… Our Lady Queen of Peace, Pray for Us! Most Sacred heart of Jesus, Have Mercy on us! Well said indeed! May God continue to bless your community and especially your courageous Bishop. Eucharistic Adoration is First and foremost along with Prayer and a personal relationship with Our Lord Jesus. His Mother is the best guide to knowing Him that anyone can ever find.Pray the rosary. These young men need to be trained in “Spiritual Warfare”..It is upon us . Read Fr.Gabriel Amorth’s statements on the times we are in. If a video of the first Holy Eucharist were available, several things would be obvious. “Aramaic” was the language, not Latin. Simple singing from the heart ,not Gregorian Chant..no pipe organs from Munich, and most of all SIMPLICITY of heart & wonderment at the things that were to come to their conclusion within the next 72 hours following. A video would show no lace, or other trappings , more “tunics” like Saint Francis ,a servant to all, the poor , and the pathetic rich people who are spiritually poor. The Holy Spirit is at work and the return of the Lord is near. “Divine Mercy” is our only hope. “The Day of Mercy”( before the terrible “DAY of Justice”) is now, as declared by Pope Francis following the Lord’s instructions to Saint Faustina. Be ready “no one knows the day or the hour”.” Watch ..you know not when the Master will come.”..Pray for our seminarians .We need more “holy priests”. Amen Joseph! Eucharistic Adoration, personal relationship with Christ, Rosary will produce much fruit. Our parish (in the Archdiocese of Washington) has had 24/7Eucharistic Adoration for 14 years. We have had 4 priests ordained and 5 in the seminary…with more to come. Get back to basics. Oh! How I love the Mass!!!!!!! …and the Holy Priests that celebrate it! Actually, five men will be ordained in June for Charlotte. Thank you Karen! Just corrected the article. I wish Cardinal Dolan in NYC would take a clue from this.Although NYC is not a hotbed of dissent there is little support for the Tridentine Mass from the Cardinal.There is no reason why the diocesean seminary and St Patrick’s Cathedral could not have one Tridentine Mass each Sunday.In addition there is no effort to bring new religious into the Archdiocese.We have dozens and dozens of Catholic grammar and high schools with no religious and all our Catholic hospitals have closed. Blessings and wonderful news in Charlotte to be followed by others in our great country.